We’re huge fans of anything that you can dip around here. But our yummy recipes for easy taco dip, bacon ranch dip and cheesy queso were probably a great hint that we’re huge fans of any type of dip. Fondue, of course it the most classic kind of dip there is. Over here, we’ve fully embrace the classic 1970’s fondue tradition. There’s a lot to say about delicious, melted cheesy goodness, cubes of bread, and wine that pairs perfectly. Fondue, of course, is a lot more than just cheesy dips (though that’s a delicious place to start). 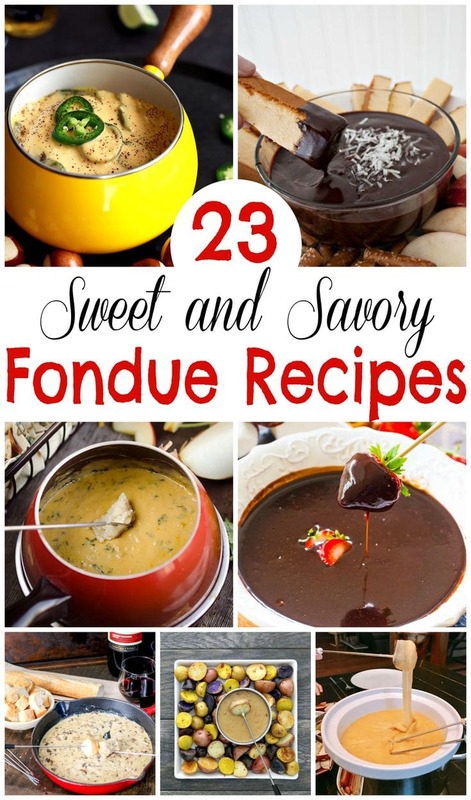 There are tasty broth fondues, oil fondue, and tasty chocolate and other dessert fondues. 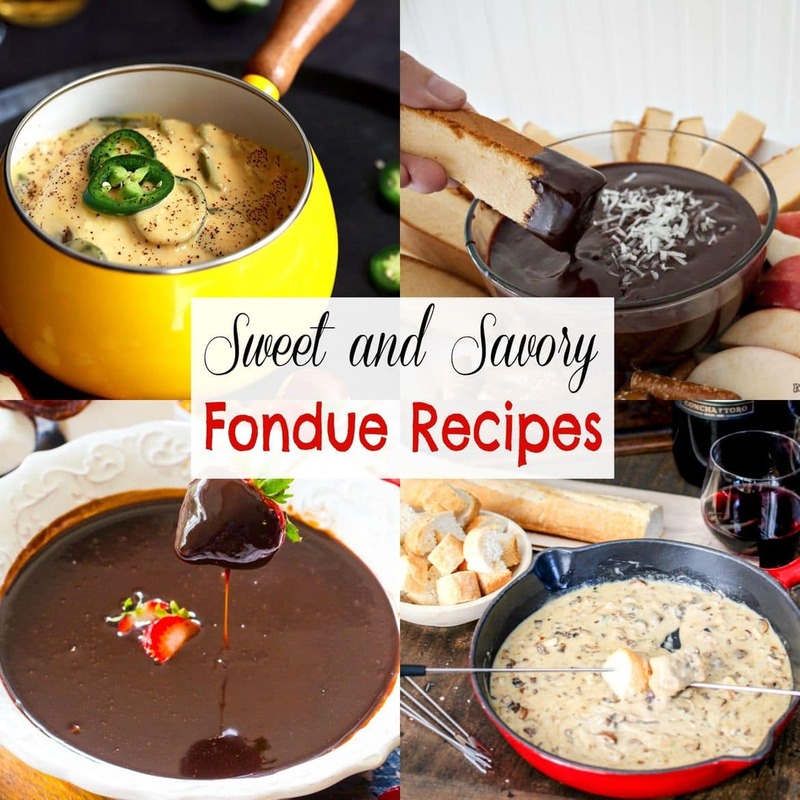 We’ve rounded up some of our favorite easy fondue recipes here to get you started. Check them out! Mexican Beer Cheese Fondue from Melanie Makes. Yum! 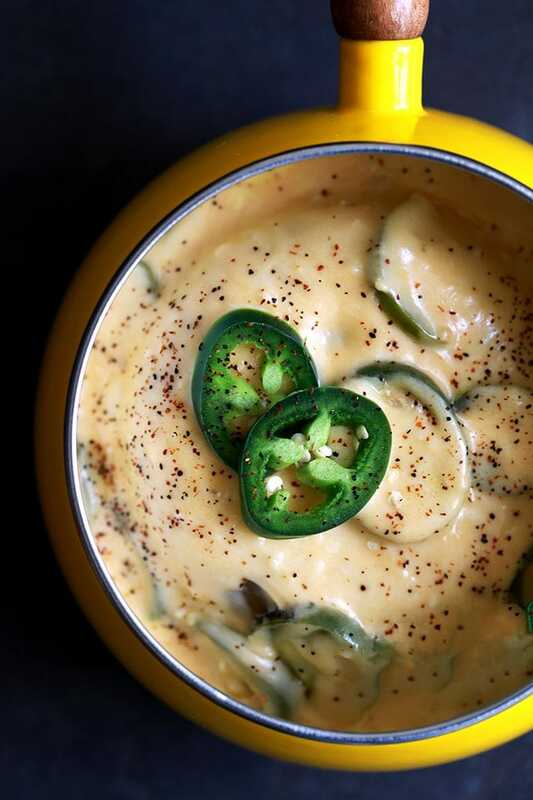 Slices of fresh jalapeno, garlic, beer and cheddar cheese make this easy seven ingredient Mexican Beer Cheese Fondue irresistible. Even better, it’s done in just 20 minutes! 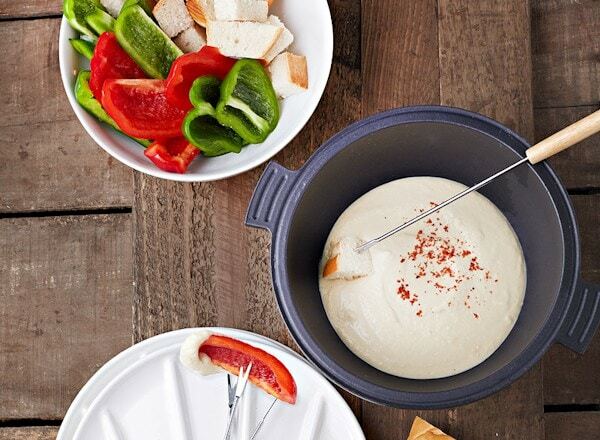 Goat Cheese Fondue Recipe from Dukes and Duchesses. This is such a simple, delicious recipe! Just bake tasty goat cheese, tomatoes, and olives quality olive oil, and serve with a fresh sourdough baguette! Vegan Fondue from Healthy Slow Cooking. There’s always a vegetarian or vegan in any crowd, and this vegan fondue is sure to please everyone, even the meat eaters in the group! It’s made with cashews, hummus and nutritional yeast. You’ll need to soak the cashews for 3 or more hours, but it’s soooo worth it. Yum! Zesty Cheddar Fondue from The Creative Bite. 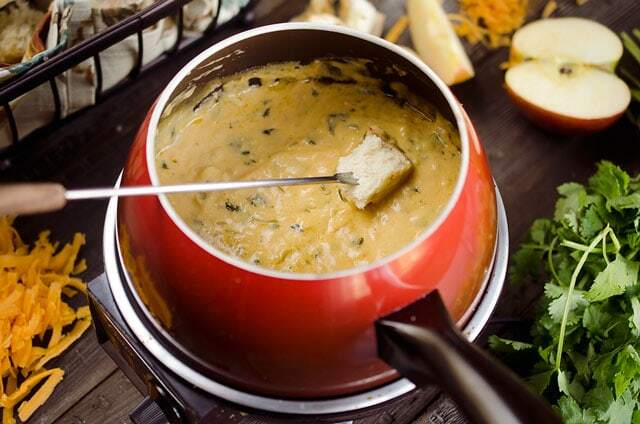 There’s a lot of flavor in this fondue, which features rich sharp cheddar, onions, garlic and cilantro. Spinach Artichoke Cheese Fondue from Food Folks and Fun. This recipe uses Butterkäse cheese, which can be hard to find, but it’s well worth the effort. Delicious! 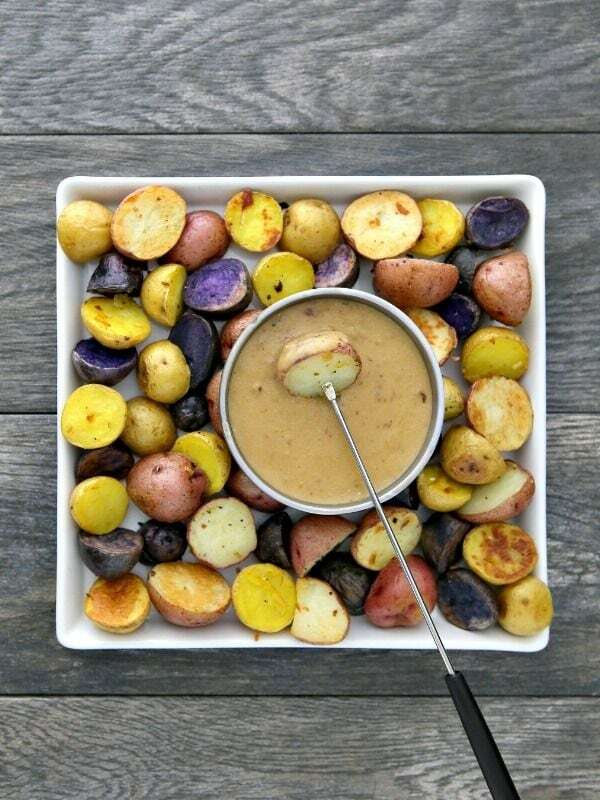 Irish Potato Fondue from Mommy Evolution. We’re all about the potato over here. This tasty recipe dunks hot, crispy potatoes into a tasty cheese dip. Yes, please! Velveeta Cheese Fondue Dip from See Vanessa Craft. Looking for a fast, easy fondue that won’t clump or separate? This is made with Velveeta, so it will stay creamy and smooth. Serve with a green Granny Smith apple, sourdough bread, and veggies like broccoli, carrot and cauliflower. Bacon Cheddar Cheese Fondue from CopyKat. The bacon lovers in your house will adore this cheesy, tasty dip flavored with chunks of bacon goodness. Three Cheese Buffalo Fondue from Domestic Superhero. Made with mozzarella, cheddar, and Swiss cheese, and your favorite buffalo wing sauce, this is a sure hit for any party. Mushroom Brie Fondue from Domestic Superhero. Looking to class up your dip game? This recipe is made with a perfect blend of three different cheese and mushrooms, and sure to impress. Roasted Pepper Cheese Fondue Sauce from Homemade Food Junkie. This is a tasty, thick cheese sauce with plenty of peppers, sun-dried tomatoes and bacon. It’s even low carb and gluten free! Rok Bistro Tomato Basil Fondue from Fearless Dining. From the popular Rok Bistro in downtown Sunnyvale, this gluten free fondue made with cheese and white wine is always an instant hit. Almond and Great Northern Bean Fondue from Healthy Slow Cooking. Break out your slow cooker for this vegan recipe, and serve with steamed veggies, toasted bread cubes, or tempeh (a fermented tofu product we love here!). 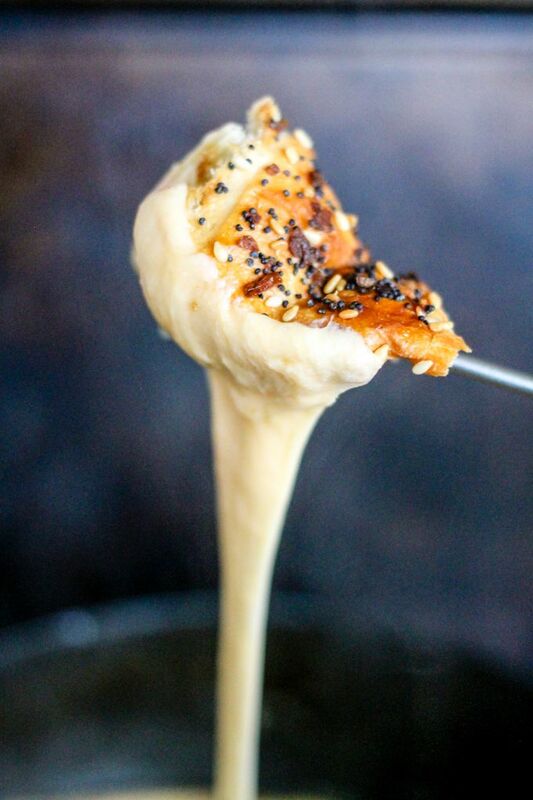 Traditional Swiss Cheese Fondue from Lauren Caris Cooks. This is the traditional fondue we know and love, made with Gruyere, Emmental, and Appenzeller cheese, plus dry white wine. German Beer Fondue from Little Family Adventure. Now this is a hearty fondue! It’s made with German Hefeweizen, sharp cheddar, and Gruyere cheeses, and served with big hunks of bread, potatoes, bratwurst or knockwurst, and veggies. This is a full meal in itself. While fondue usually brings up classic 70’s images of cheesy goodness with fresh bread for dipping, dessert fondues are hugely popular too. We’ve even been known to serve up a huge plate of fresh fruit cut up with a simple chocolate fondue for a delicious afternoon snack. So good! Chocolate Caramel Fondue from Suburban Simplicity. Chocolate, caramel, melted goodness. Yum! Slow Cooker Chocolate Fondue from Sweet and Savory Meals. This is a great recipe to make ahead. Just pop the ingredients in your slow cooker, and come back to chocolate goodness hours later. Easy Chocolate Fondue from The Kitchen Is My PlayGround. 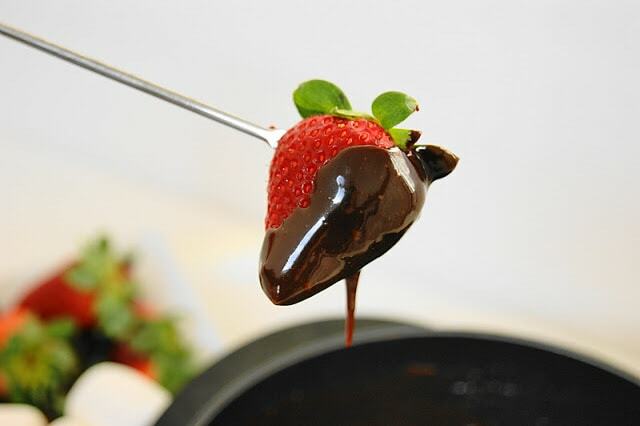 This is the perfect recipe if you’re looking for a quick easy, chocolate fondue. No fuss, and cooks up in no time. 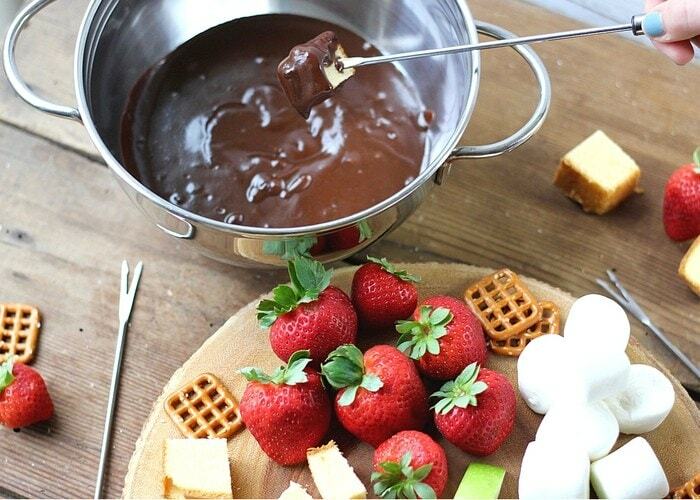 The Best Chocolate Fondue with Ghirardelli Chocolate from Live Laugh and Craft. I love Ghirardelli Chocolate, and this delicious recipe is well worth the time to make. 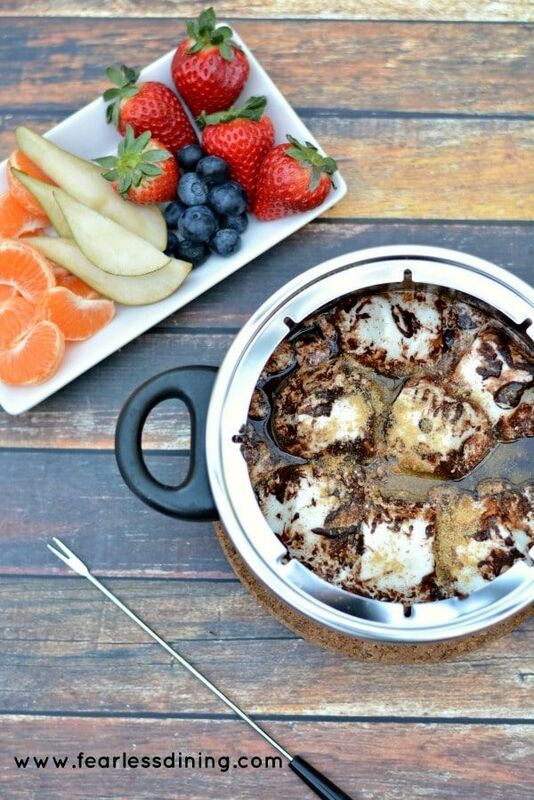 Quick and Easy S’mores Chocolate Fondue from Fearless Dining. Chocolate and marshmallows are just made to go together, and this recipe proves the s’mores and fondue are perfect partners as well. 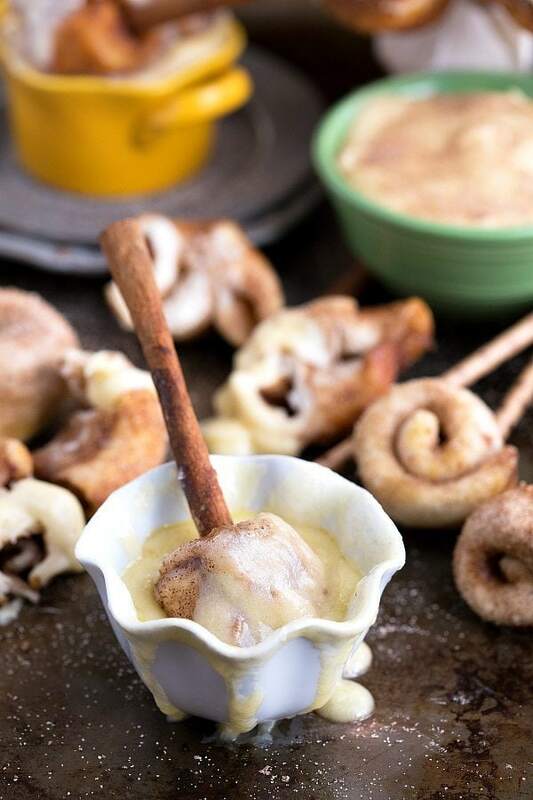 Slow Cooker Cinnamon Roll Fondue with 20 Minute Miniature Cinnamon Rolls. If you love cinnamon rolls, this is the fondue for you. Even better, it’s made in the slow cooker, so it’s easy to prepare. Coconut Chocolate Fondue from Making The World Cuter. Made with coconut syrup, this is delicious with apple slices, pretzel sticks and a pound cake.